Q. Will the shipping company hook up the ice maker on my fridge or the gas line on my stove? A. Our delivery personnel are handy, but they’re not authorized to connect water lines. Many of our customers read through the homeowner’s manual and connect the water line themselves. You can also hire a plumber for extra help. Q. Do you sell scratch & dent units at a discounted price? A. Yes, we occasionally have brand new appliances with very minor damage. Give us a call to find out what colors we currently have in stock. Act fast, these units go quickly. Q. Will the refrigerator fit through my door? A. Check out our fridge specifications page to see all measurements. As a last resort, fridge doors can be removed. Please measure carefully. We cannot accept returns on fridges that do not fit in your house. Q. What is the warranty on your appliances? A. 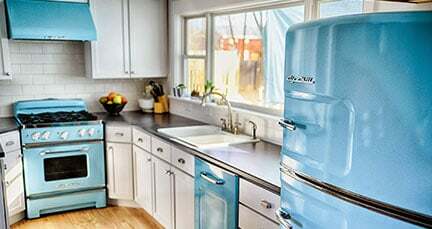 Our Big Chill fridges, stoves, hoods, wall ovens and microwaves have a one year warranty on parts and labor. Our Dishwasher warranty is one year on parts and labor, limited lifetime warranty on the stainless steel tub and inner door. Q. Where is the ice maker located in the fridge? A. The ice maker is an interior option. We’re able to keep the vintage look outside and give you the modern amenities inside! Q. Where is Big Chill available? A. Currently, we are only able to warranty our fridges, microwaves, stoves and dishwashers in the Contiguous/Lower 48 United States and metropolitan areas of Canada. We occasionally sell the product outside of these areas, but we don’t cover warranty or repair outside our shipping boundaries. Q. 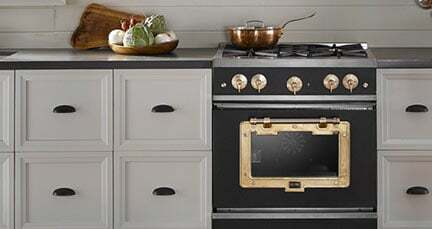 Do you offer custom colors for your vintage appliances? A. Yes! 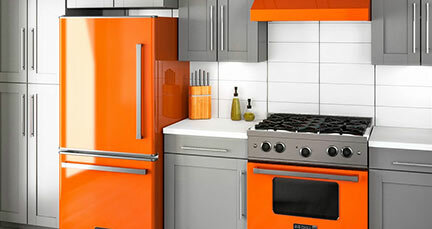 We now offer a wide variety of custom RAL colors with our fridges, microwaves, dishwashers, stoves, hoods and wall ovens. Check out our custom colors page for the details. Q. What do I measure before I place an order and what type of delivery do I need? A. Please watch this video to learn how to measure the space your appliance will go in before you place an order. Also, download this helpful guide to figure out if you need inside or curbside delivery – plus, a place where you can write down your measurements. Q. What is the difference between a Curbside and an Inside delivery? A. A Curbside delivery is typically brought to the first dry area near your home. You are responsible for uncrating the appliance and getting it in your house. With a Curbside delivery, grab a tool set and a few of your strongest friends. The shipping weight for the fridge is close to 400 lbs. The shipping weight for the stove is close to 300 lbs. With an Inside delivery, our shippers uncrate your appliance, bring it into your kitchen, remove all packaging and take the debris with them. Stairs, door removal and old fridge removal to the curb are extra charges. Q. Who makes the internal components of your Big Chill appliances? A. We use big name components with our appliances. Give us a call for the details. Q. What are the advantages of the powder coat paint you use? A. Powder coating gives customers the longest-lasting, and most color-durable quality finish available. Powder coated surfaces are more resistant to chipping, scratching, fading, and wearing than other finishes. Colors stay bright and vibrant longer. Powder coating is also highly protective of our environment. While liquid finishes contain solvents which have pollutants known as volatile organic compounds (VOCs), powder coating contains no solvents and releases negligible amounts, if any, of VOCs into the atmosphere. Thus, there is no longer a need for finishers to buy costly pollution control equipment. In addition, most powder coating overspray that does not adhere to the part can be retrieved and reused, virtually eliminating the waste commonly found in liquid finishing processes. Q. What is your cancellation and return policy? You have 60 days to return the item unless it is damaged or excessively used. In the unlikely event that you receive a product that’s been damaged in transit or is defective, please contact us on receipt. In order to receive a repair, refund or replacement, we ask that you notify us within 72 hours of receiving your product. Items sent via curbside delivery must show proof (curbside pictures) of curbside damage to be eligible for a repair. Big Chill reserves the right to refuse returns. Q. How can I see an exact color sample? A. You’ve got 2 options. All of our appliance retailers have color samples on display. Give us a call and order a metal color sample. The cost is $5. Call us at 1-877-842-3269 with any questions. Q. Are your fridge and dishwasher doors metal or plastic? A. METAL, of course. Our steel doors are fabricated using a traditional stamping process…just like they did back in the ’50s.